Home » Blog » IQ Book Two: The White House » North to Alaska. Alaskans are wonderfully opinionated and not shy about sharing those opinions whether you want to hear them or not. I like this attitude. At the same time, they are very laid back. And I have a family connection to Alaska. Marie’s mother Yupik, born in the far north before Alaska was a state. As I fly north I’m working on the First Chapter of the 3rd I,Q book, which we will put at end of I,Q2 (if that makes sense). This does not mean I,Q3 is underway…but I am thinking about it. I have some other novels to finish before I start in on I,Q3. I had dinner with my host in Ketchikan, librarian Charlotte Glover and her husband, David, who is a jazz muscian and the Mayor of Ketchikan. It was great hosting you, if only for a day! Come back soon. We have more to talk about! 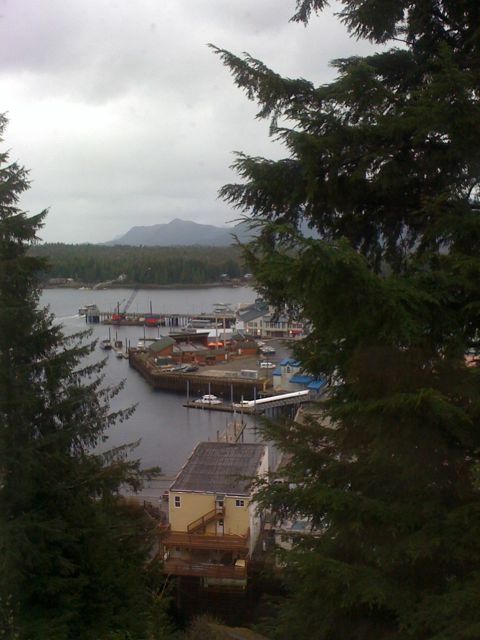 I’d hang with the mayor of Ketchikan anytime. And the hotdogs at the airport were delicious. Hi Roland, I am a 6th grader and I am doing a project on Tentacles as my favorite book. The project includes a summary, a presentation and some items representing the book. Any advice? ← The Dreamer by Pam Munoz Ryan. Heading to Alaska.